This beautiful and sombre monument incorporates Soane's favourite emblems of Creativity and Eternity, the pineapple and ouroboros (a serpent swallowing its own tail). 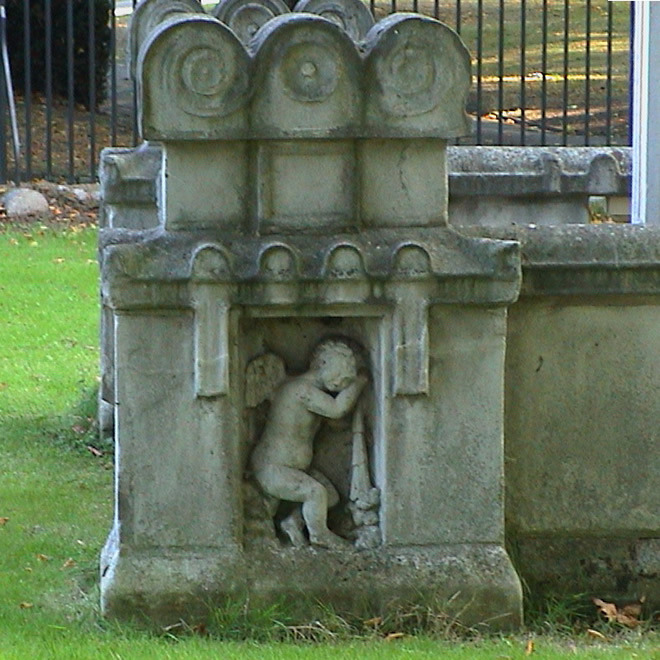 This grade I listed mausoleum, designed by Sir John Soane was erected in 1816 following his wife's death in 1815 and entombs his wife and son as well as himself. The "outstandingly interesting monument. . . . Extremely Soanesque with all his originality and all his foibles" (Nikolaus Pevsner) bears testimony to the importance of the structure. The central marble cube has four faces for dedicatory inscriptions, enclosed by a marble canopy supported on four Ionic columns. Enclosing this central structure is a stone balustrade with a flight of steps down into the vault itself. The understated classicism of the design is widely seen as one of Soane's most inventive creations and the central domed structure influenced Sir Giles Gilbert Scott's design of the K2; and subsequent telephone kiosks. It is one of only two Grade I listed monuments in London (the other being Karl Marx's tomb in Highgate). Following vandalism in 1869 it was suggested that it should be relocated to the safety of Lincoln's Inn Fields. It was restored in 1996 by the Soane Monuments Trust and following further vandalism, restoration was carried out in 2000 - 01 as part of the London Borough of Camden's major restoration of St. Pancras Gardens, supported by the Heritage Lottery Fund. For a professional assessment of this architectural gem we direct you to English Buildings. 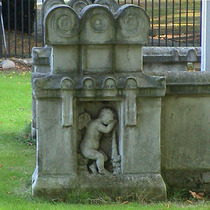 Sir John Soane, R.A. F.R.S. Portland stone, 6 tonnes. CWO has more information about this bench.